owners turned almost exclusively to diesel. Only in terms of the large express liner could steam be classed as more eco- nomic than diesel in the late 1930s. U.S. were direct drive reversing engines. Rapid expansion of demand for engines in the 50s and 60s led to a wide range of engines for propulsion varied from about 100 to about 5,000 bhp. Single reduction gear sets fitted with control- lable reversing propellers or reversing reduction gears were available in a variety of sizes and the installation and capi- tal costs of this arrangement were considerably lower than those of a steam plant. Postwar diesel engine development proceeded in two almost diametrically opposed directions. For naval applica- tions, engines were small, high-speed, and light-weight. Yet in merchant ships the trend was toward large, slow-speed engines of high power and high efficiency that burned cost- ly fuels and maintained lower rpm to match lower propeller speeds. Diesel propulsion became more and more dominant in merchant ships even before the oil shortage in the 1970s overshadowed all other considerations in selecting machin- ery. In the late 80s and early 90s engineers began to recognize the attributes of gas turbine power that would make it acceptable for commercial use. To preserve the maximum amount of ship space for generating revenue, owners sought compact and lightweight power solutions. The first main commercial use for gas turbines was in fast ferries. Today, space concerns and environmental interests have led some cruise lines to take another look at gas turbine technology. 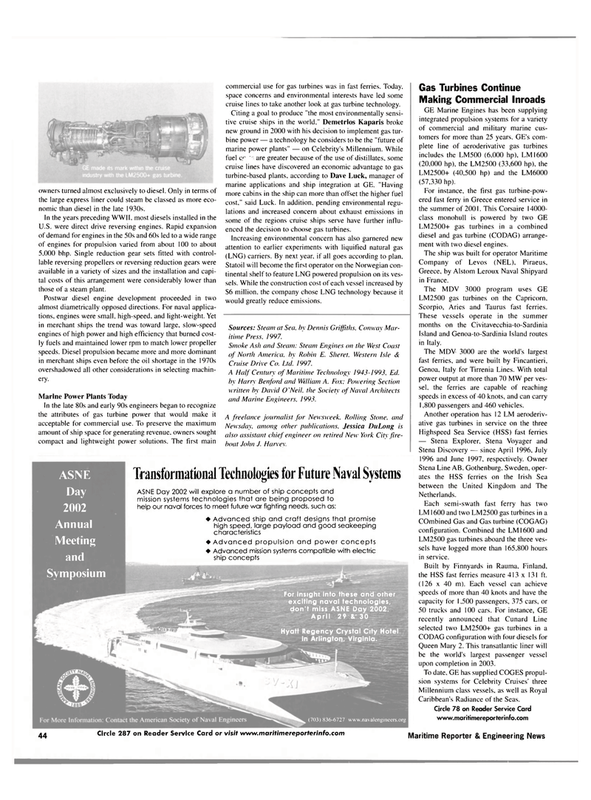 Citing a goal to produce "the most environmentally sensi- tive cruise ships in the world," Demetrios Kaparis broke new ground in 2000 with his decision to implement gas tur- bine power — a technology he considers to be the "future of marine power plants" — on Celebrity's Millennium. While fuel cr ' are greater because of the use of distillates, some cruise lines have discovered an economic advantage to gas turbine-based plants, according to Dave Luck, manager of marine applications and ship integration at GE. "Having more cabins in the ship can more than offset the higher fuel cost." said Luck. In addition, pending environmental regu- lations and increased concern about exhaust emissions in some of the regions cruise ships serve have further influ- enced the decision to choose gas turbines. Increasing environmental concern has also garnered new attention to earlier experiments with liquified natural gas (LNG) carriers. By next year, if all goes according to plan. Statoil will become the first operator on the Norwegian con- tinental shelf to feature LNG powered propulsion on its ves- sels. While the construction cost of each vessel increased by $6 million, the company chose LNG technology because it would greatly reduce emissions. Sources: Steam at Sea, by Dennis Griffiths, Conway Mar- itime Press, 1997. Cruise Drive Co. Ltd. 1997. A Half Century of Maritime Technology 1943-1993, Ed. by Harry Benford and William A. Fox: Powering Section written by David O'Neil, the Society of Naval Architects and Marine Engineers, 1993. LM2500+ (40,500 hp) and the LM6000 (57,330 hp). LM2500+ gas turbines in a combined diesel and gas turbine (CODAG) arrange- ment with two diesel engines. Greece, by Alstom Leroux Naval Shipyard in France. Scorpio, Aries and Taurus fast ferries. Island and Genoa-to-Sardinia Island routes in Italy. Genoa. Italy for Tirrenia Lines. With total power output at more than 70 MW per ves- sel. the ferries are capable of reaching speeds in excess of 40 knots, and can carry 1,800 passengers and 460 vehicles. LM2500 gas turbines aboard the three ves- sels have logged more than 165,800 hours in service. Queen Mary 2. This transatlantic liner will be the world's largest passenger vessel upon completion in 2003. Caribbean's Radiance of the Seas. Hyatt Regency Crystal City Hotel in Arlington, Virginia.